Maintenance: Scrub with a damp cloth and dry with a dry cloth. Process: hand-made, electrostatic spray paint, high-temperature paint. Suitable occasions: home, living room, bedroom, study, balcony, cafe, bar, flower shop, etc. can be placed. 1:Products include: flower stand *1. 2:The size of manual measurement may have slight errors, please understand. 3: Due to camera angle and light refraction may have a slight color difference, please prevail in kind, please understand. Made of excellent materials, strong and durable, strong bearing capacity. 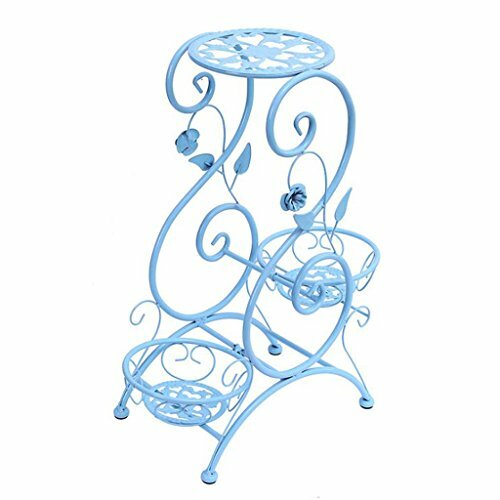 The flower rack is made of high-strength welding technology,The welded joints are neat and rounded, the joints are natural and beautiful, and the welding is truly seamless to ensure the stability of the product. Exquisite paint process, smooth paint, uniform color, not easy to fall off or fade, longer service life. Personality design, beautiful appearance, exquisite, place the living room, study, bedroom, office, are all very good visual enjoyment. If you have any questions, feel free to contact us, 24 hours to serve you. If you have any questions about this product by YE, contact us by completing and submitting the form below. If you are looking for a specif part number, please include it with your message.